All eyes are certainly on the skies as we look off to the west as a powerful storm system begins moving it’s way into the region and that means severe storms likely later today. We’ve got quite the weather scenario set to play out later on today and into tonight. 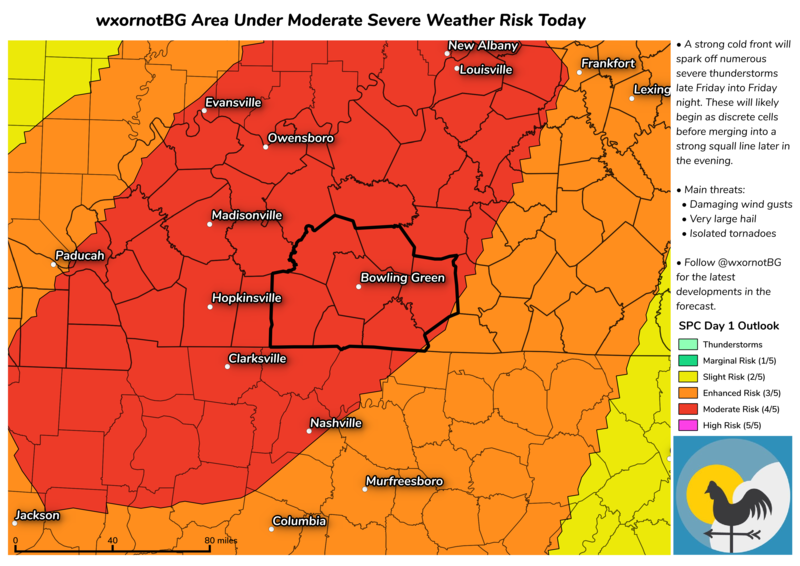 At this moment, we’re under a moderate risk of severe weather. This is a 4 on a scale of 5, and that is definitely something we are going to want to pay attention to this afternoon. Data from the Storm Prediction Center. This is mainly because of a powerhouse low pressure system that will trail a cold front into our region. This means we will definitely see thunderstorm development. 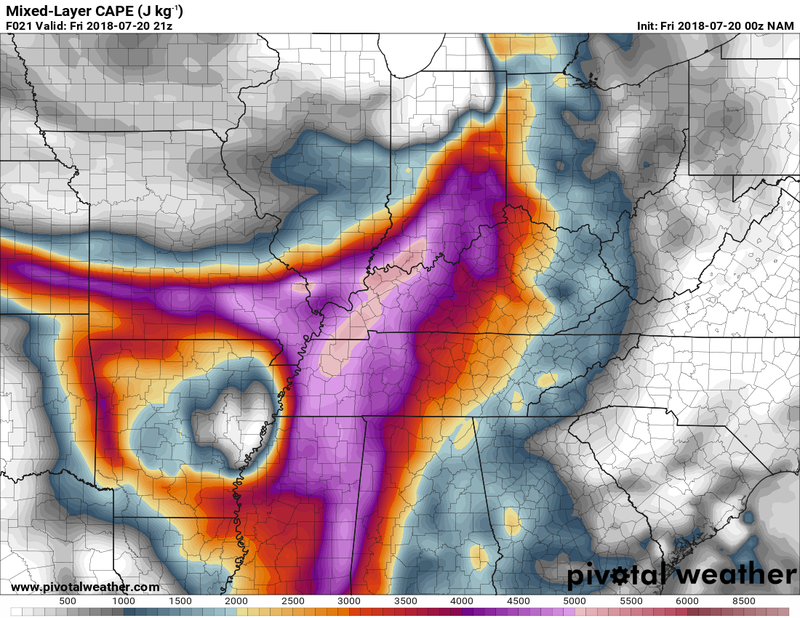 As expected for the summer, we’ve got plenty of CAPE (or convective available potential energy, essentially thunderstorm fuel), with values approaching 4000 J/Kg…that is some extreme instability! Mostly thanks to those temperatures in the upper 80s with dew points creeping back north of 70º. This means we’ll have plenty to keep those thunderstorms going. What’s not expected for the summer, though, is the presence of a lot of wind energy and shear (change of wind direction and height) in the atmosphere. 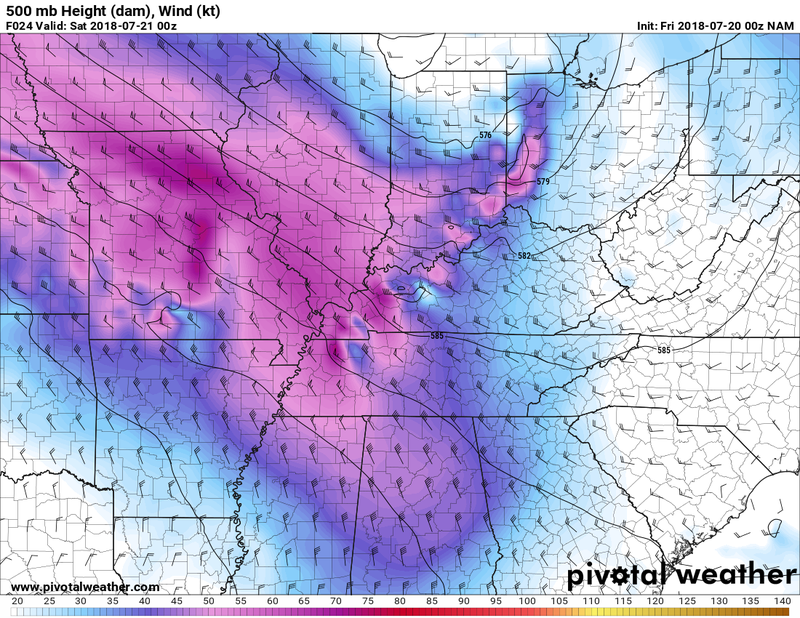 That will give the thunderstorms the potential to produce severe weather. This means the ingredients are more than present for severe weather. Models have been waffling a bit on timing the past few days but we’re starting to nail things down. We have a line of weakening thunderstorms moving through northeast of the area this morning. This is setting us up for clearing in the afternoon, allowing our atmosphere to destabilize and enhancing our severe weather risk for the evening hours. This line of storms for this afternoon and evening will start out as discrete, individual supercells capable of very large hail upwards of 2 inches in diameter (thanks to the impressive amount of instability), damaging winds and isolated tornadoes. The later we go into the evening, these cells will begin to merge more of a linear storm mode, indicating a high likelihood for strong winds in excess of 60-65 MPH capable of wind damage. As far as timing, the evening round will get cranking to our west and northwest this afternoon and roll toward our area in the 7-11pm time frame. Obviously, we’ll be monitoring this all day and will have further updates and timing adjustments throughout the day as needed. But it looks like a significany severe weather episode is shaping up for the area. Beyond today’s severe weather threat we will also be watching for daily chances of scattered storms throughout the weekend and into next week as a cut-off low spins to our north. Things will stay warm and muggy too with highs in the 80s. Follow our live weather feed @wxornotbg for the latest updates throughout the day on this unfolding severe weather situation. We will also have updates throughout the day right here on the website as well as on Facebook. 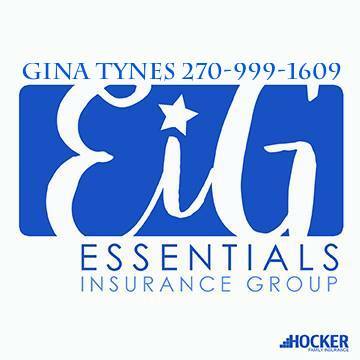 Have a terrific Friday, and remember: stay weather aware!